Colorado Marijuana Edibles Brand Dixie Elixirs Go National! Medical Marijuana edible company Dixie Elixirs & Edibles have been supplying some of Colorado's favorite marijuana edibles and cannabis infused products since 2009. 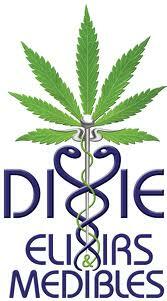 There are currently around 590 marijuana dispensaries in Colorado and Dixie Elixirs Edibles are sold in 450 of them. Now the popular marijuana based foods and products manufactured and distributed by Dixie Elixirs and Edibles will be available in other states in the U.S. with laws permitting the use of marijuana for medicinal purposes. Dixie Elixirs A carbonated drink infused with THC from a blend of quality sativa dominant marijuana. Several flavors of the marijuana infused drink are sold at dispensaries. Dixie Edibles Made using fine blends of Sativa weed strains, Dixie Edibles boasts a full line of delicious THC-infused marijuana edibles that deliver! Dixie Tinctures A concentrated sub-lingual liquid MMJ product that is taken by placing a few drops of the liquid tincture under the tongue for the rapid delivery of THC and quick relief from pain. Dixie Botanicals Natural topical treatments to sooth pain without the high associated with smoking weed or eating marijuana edibles. Dixie Elixirs & Edibles is based in Denver, Colorado, where it manufactures all of its products using natural ingredients and discreet packaging. See the video below for more information on Denver, Colorado based medical marijuana edibles company Dixie Elixirs' plans to go national with its products.